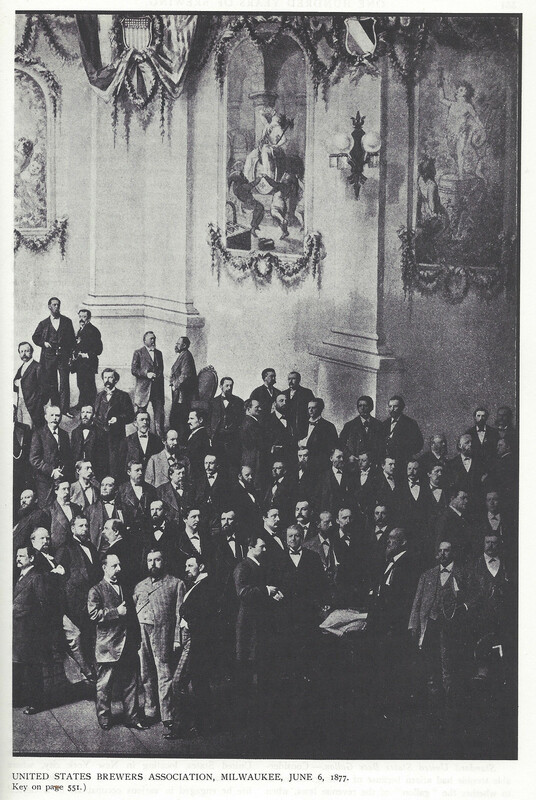 This is an interesting photo I came across in 100 Years of Brewing, which was originally published in 1903. 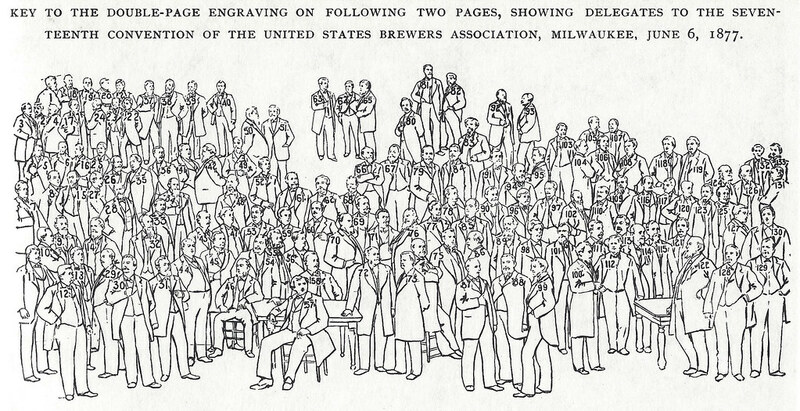 This two-page double truck is a photo of all the attendees of the Seventeenth annual convention of the United States Brewers Association, which was held in Milwaukee, Wisconsin. The photo was taken on June 6, 1877. 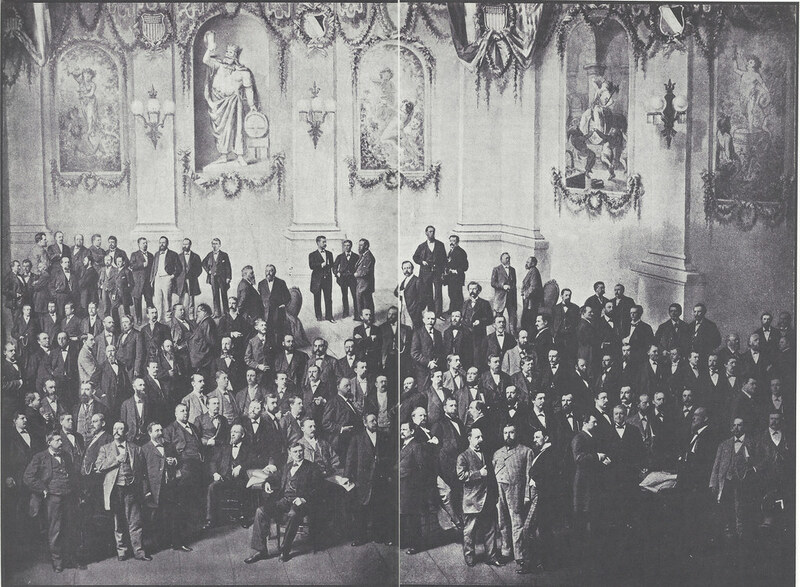 There are 133 people in the photo, although not all of them are identified. Quite a few of the people in the photo are, or rather were, pretty big deals in the brewing industry at that time, which makes sense. 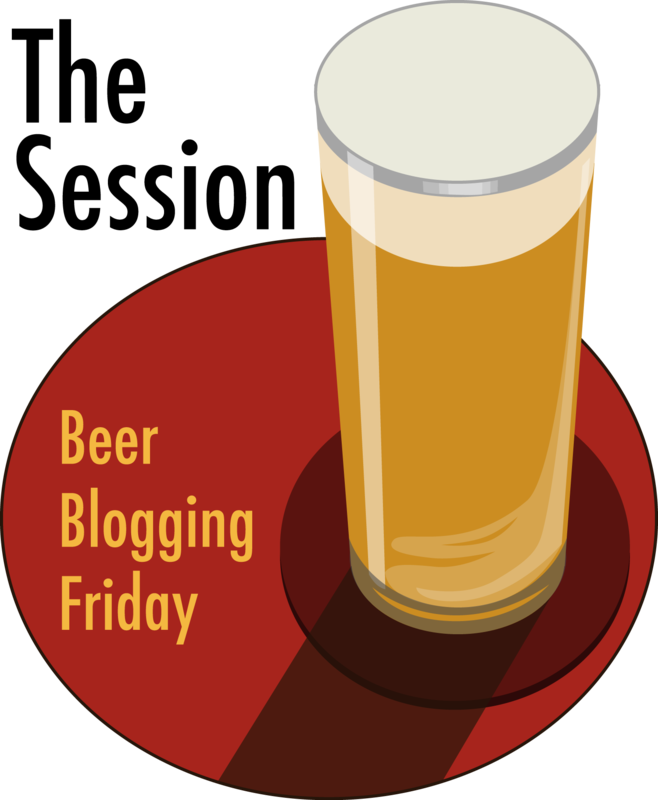 This was, after all, the biggest trade convention for brewing. 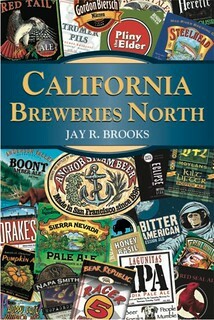 But when you read the names, it’s a veritable who’s who of the brewing industry. Luckily, they included a numbered key to identify the people in the picture. 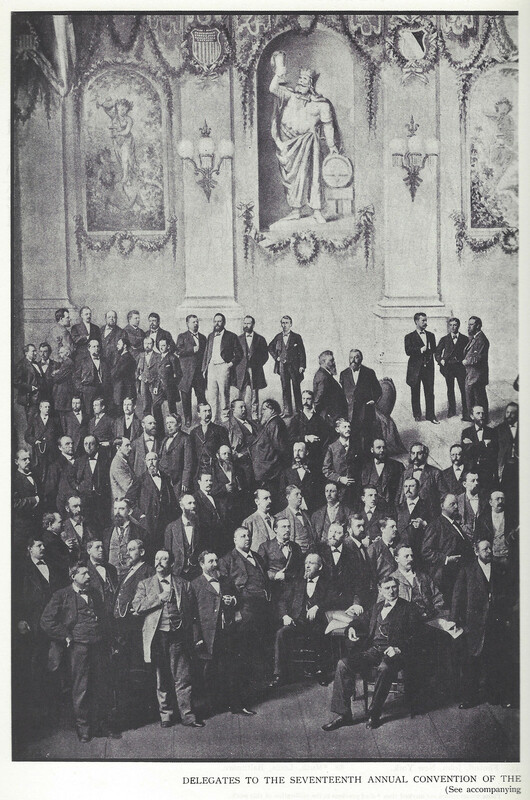 Interestingly, even though the photo was taken in 1877, by the time it was published in “100 Years of Brewing,” 26 years later, 55 of the 133 people in the photo had died, or over 40%. Here are slightly larger images of the two pages, first the left page, followed by the right. 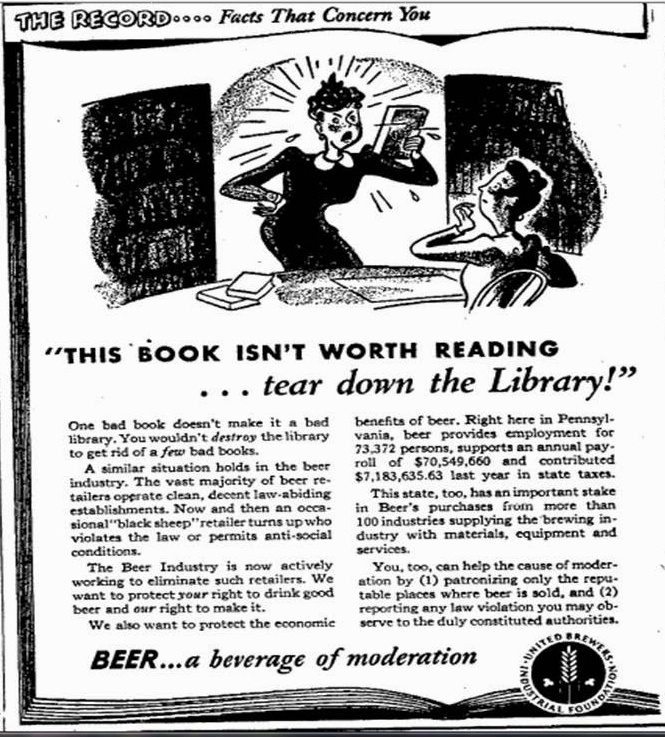 Monday’s ad is for is by the United Brewers Industrial Foundation, from 1938. 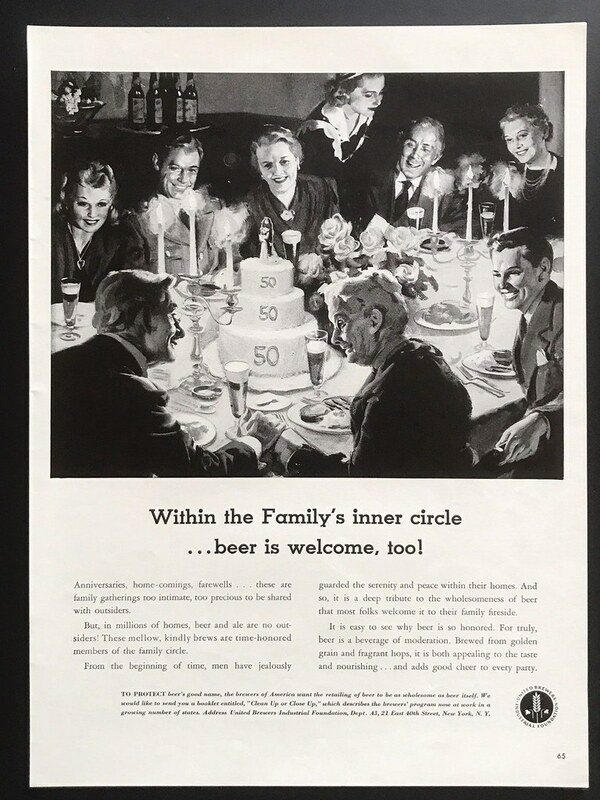 Beginning during World War II, the USBIF began a series of positive ads under the name “Morale is a Lot of Little Things” followed by an unnumbered series of illustrated ads that were a precursor to the numbered “Home Life in America,” the crown jewel of ads which ran from 1945 to 1956, also known as the Beer Belongs series. But they didn’t end there, and for a short time afterward, beginning in 1956, several more similar ads were created but without the numbering or the “Home Life in America” association. 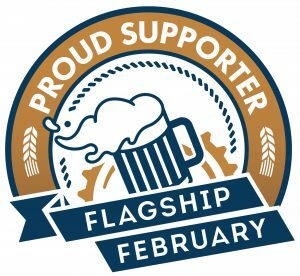 But even before those efforts, the UBIF put their toe in the trade advertising pond with ads under the title “The Record … Facts That Concern You” and always ending with the tagline “Beer … a beverage of moderation,” and the continued on with some similar-themed ads after that. 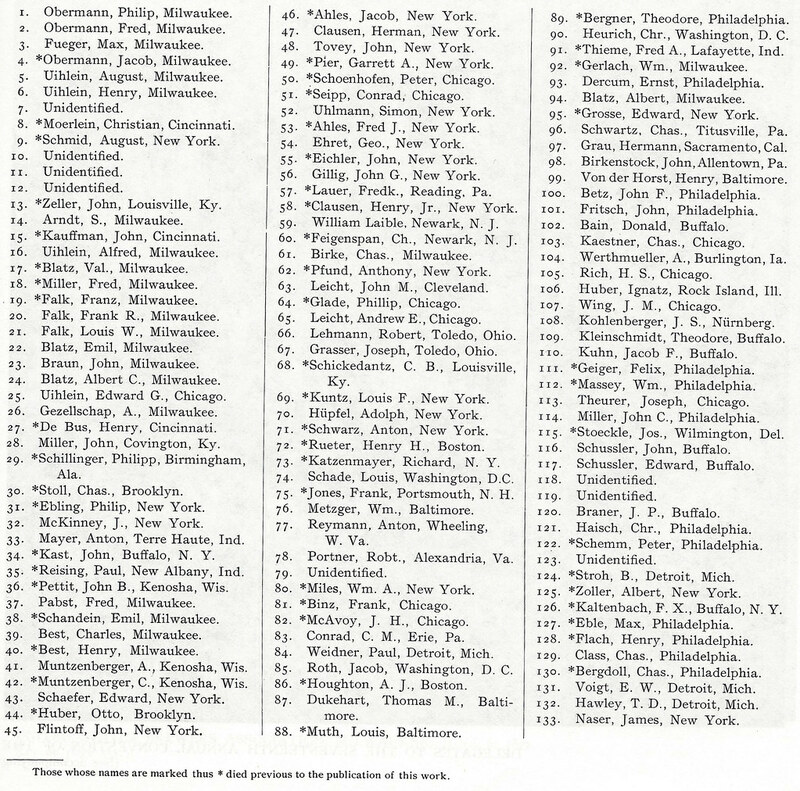 In this ad, with the headline “Yes… the brewers do mean business,” the ad is all about “Beer Statesmanship” and ensuring all of the bars and retailers selling beer post-prohibition do so in a positive manner with no illegal activities or unscrupulous practices taking place in them. This was their attempt to clean up their image and, in effect, undo the damage of the smear campaign and propaganda that the prohibitionists employed to get prohibition passed in the first place, and which they returned to immediately after its repeal. Sunday’s ad is for is by the United Brewers Industrial Foundation, from 1940. 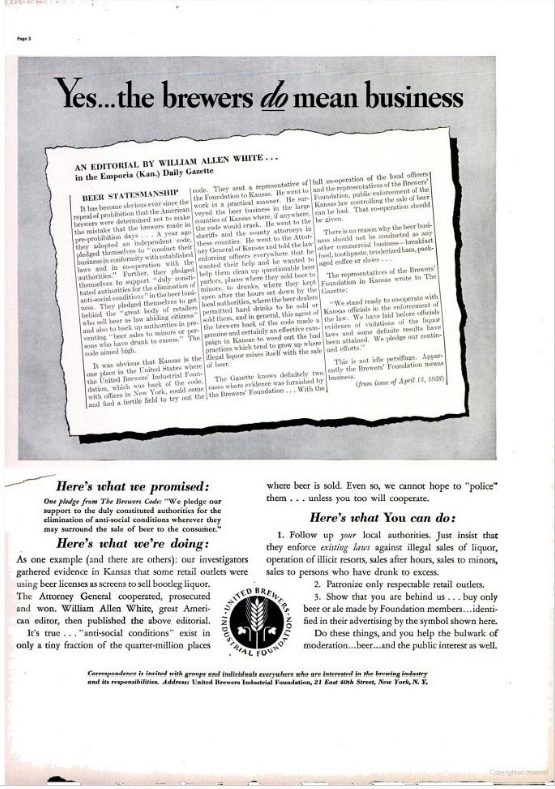 Beginning during World War II, the USBIF began a series of positive ads under the name “Morale is a Lot of Little Things” followed by an unnumbered series of illustrated ads that were a precursor to the numbered “Home Life in America,” the crown jewel of ads which ran from 1945 to 1956, also known as the Beer Belongs series. But they didn’t end there, and for a short time afterward, beginning in 1956, several more similar ads were created but without the numbering or the “Home Life in America” association. But even before those efforts, the UBIF put their toe in the trade advertising pond with ads under the title “The Record … Facts That Concern You” and always ending with the tagline “Beer … a beverage of moderation,” and the continued on with some similar-themed ads after that. 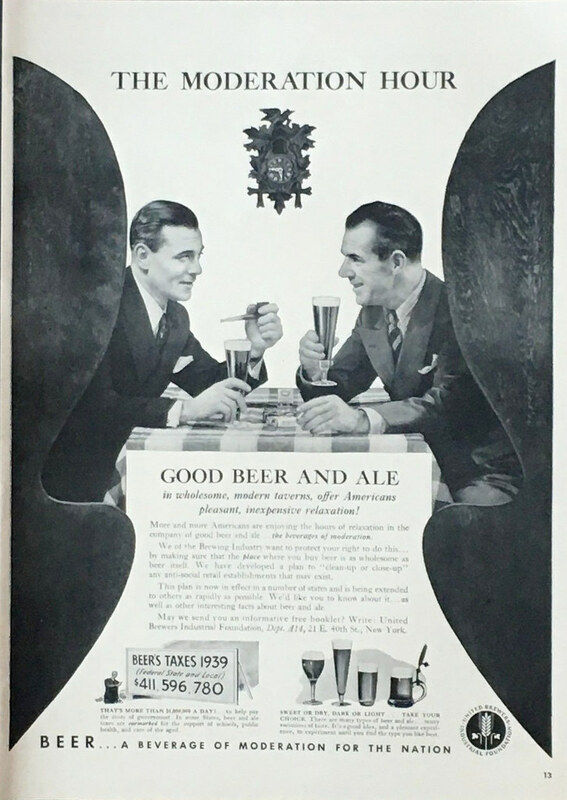 In this ad, with the headline “The Moderation Hour,” the scene is two men in what I think is supposed to be a booth at a bar having a beer together. But the cuckoo clock on the wall behind them doesn’t have any chains or weights to make it work, or the pendulum for that matter. But the tagline below the table is what the ad is trying to promote. “Good Beer and Ale in wholesome, modern taverns, offer Americans pleasant, inexpensive relaxation!” And they point out that all that relaxing led to the industry paying $411,596,780 in state and federal taxes. 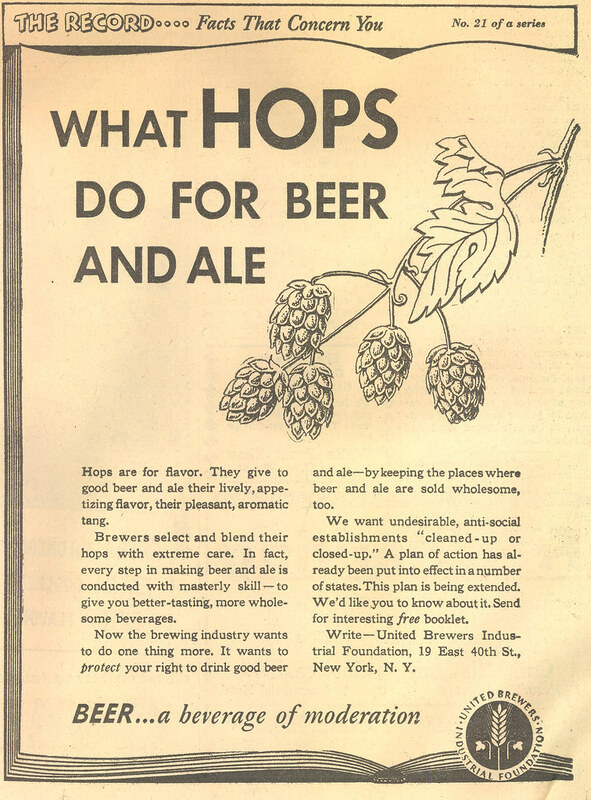 In this ad, with the headline “What Hops Do For Beer And Ale,” the short answer is they’re “for flavor.” One curious aspect of this particular ad is that in the upper right-hand corner it indicates that this ad is “No. 21 of a series.” So far, I’ve only found three ads with this same “The Record” banner at the top. I’d long suspected there must have been more, but this leads me o believe there are many more, at least 21 and probably more than that. I wonder where they are? 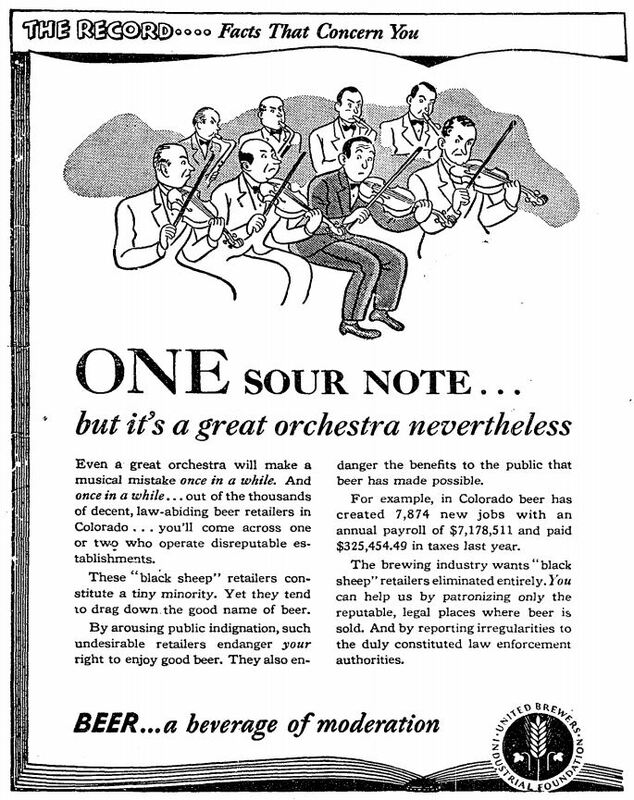 In this ad, with the headline “One Sour Note,” they’re making the case that just because you might find one unscrupulous beer retailer that they’re not all bad and you shouldn’t paint the entire industry as bad because of that one bad apple, all using the analogy of many musicians making up the sound in an orchestra. Monday’s ad is for is by the U.S. 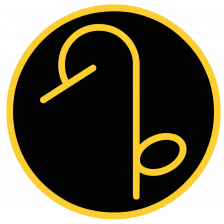 Brewers Foundation, from 1959. 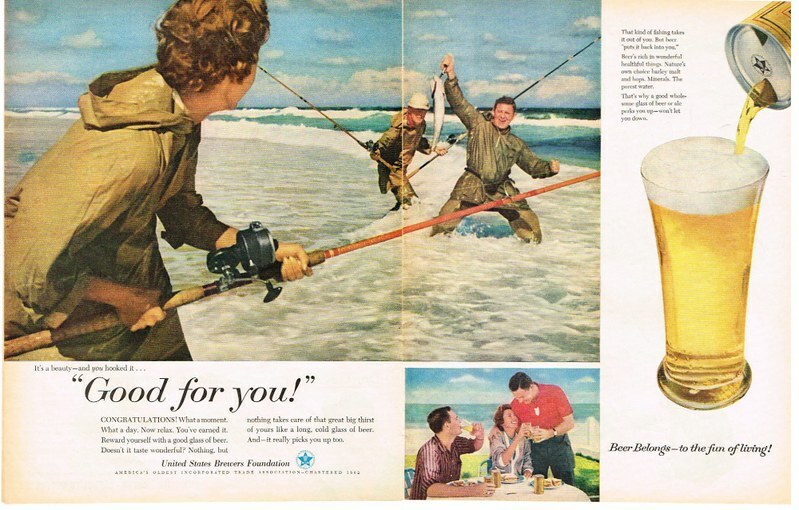 Beginning during World War II, the USBIF began a series of positive ads under the name “Morale is a Lot of Little Things” followed by an unnumbered series of illustrated ads that were a precursor to the numbered “Home Life in America,” the crown jewel of ads which ran from 1945 to 1956, also known as the Beer Belongs series. But they didn’t end there, and for a short time afterward, beginning in 1956, several more similar ads were created but without the numbering or the “Home Life in America” association. 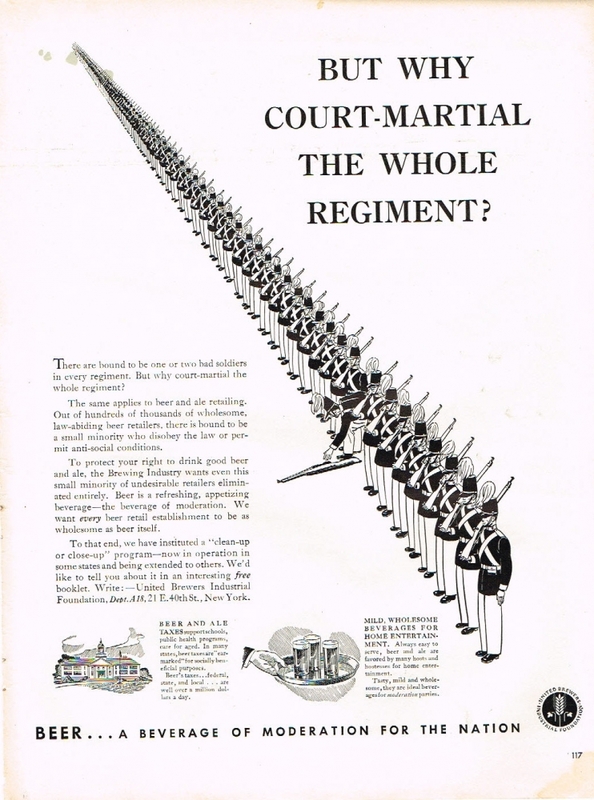 Shortly thereafter, the ads continued to use thematic elements from the earlier ads, but they became more conventional, using photographs instead of art. Sunday’s ad is for is by the U.S. 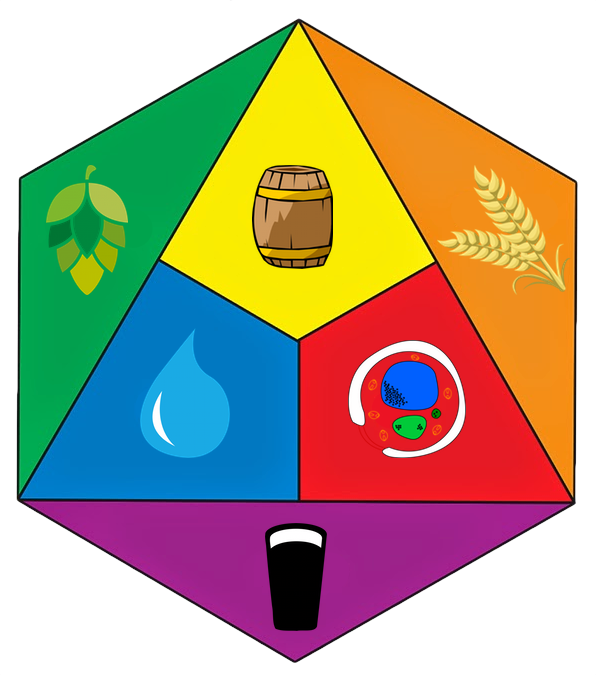 Brewers Foundation, from 1959. 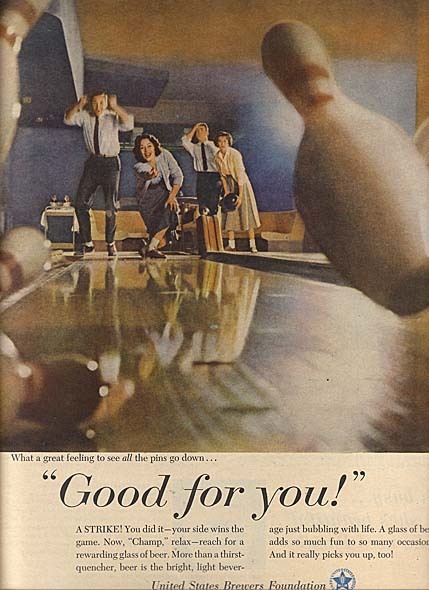 Beginning during World War II, the USBIF began a series of positive ads under the name “Morale is a Lot of Little Things” followed by an unnumbered series of illustrated ads that were a precursor to the numbered “Home Life in America,” the crown jewel of ads which ran from 1945 to 1956, also known as the Beer Belongs series. But they didn’t end there, and for a short time afterward, beginning in 1956, several more similar ads were created but without the numbering or the “Home Life in America” association. Shortly thereafter, the ads continued to use thematic elements from the earlier ads, but they became more conventional, using photographs instead of art. In this ad, another one entitled “Good For You,” a trio of people are fishing on the beach, and it looks the woman in the foreground has caught a good-sized fish, which one of the men is holding up proudly. After this, they’re all going to need some beer.